South Sudan President Salva Kiir waves as he greets schoolchildren at Juba International Airport in Juba on Sept. 13, 2018, after returning from the Ethiopian capital Addis Ababa where the latest peace agreement with opposition leader Riek Machar was finalized. South Sudanese President Salva Kiir says he called rebel leader Riek Machar to urge him to pull back his troops after reports of fighting in parts of Yei River state. "It was my initiative to call him and ask him why he is still fighting us when we have signed the agreement. So I told him, 'What is this? Is it the acquisition of more territories? We have signed the agreement. I don't want us to go back to war again. So, you talk to your commanders in the field so that they don't attack us again,'" Kiir said. FILE - South Sudan's President Salva Kiir, right, and his former deputy turned rebel leader Riek Machar shake hands as they make a last peace deal at the 33rd Extraordinary Summit of Intergovernmental Authority on Development (IGAD) in Addis Ababa, Sept. 12, 2018. "I want to personally assure you that the agreement we have just signed has ended the war. Your suffering provided the primary motivation for this government to pursue peace by all means necessary," Kiir told the congregation. "I want to appeal to all of you to accept and embrace this peace agreement [and forgive] your brothers and sisters from the opposition side and so that we close the dark chapter on the wall by forgiving each other. 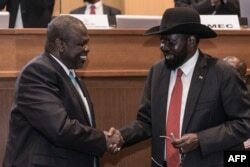 We give the chance to peace and prosperity of our peace and our nation," Kiir said. A civil society activist who prefers to be identified only as "Benson" for security reasons tells VOA's South Sudan In Focus that civilians fear for their lives. "I see people who are kind of being reserved now in the way they talk, the way they walk, they do their things in town because people are having this suspicion that something at any time can happen," said the activist.